Would someone know a short, concise history of the Buda Engine Company? I am working on a corporate history of the Edwards Motor Car Co. and for twenty years this company built self-propelled railroad coaches that used Buda engines. I would like to include a brief history of the founding and other products produced by Buda. Thanks in advance for your assistance. You'll find references to the Buda story in Stan Grayson's book Engines Afloat Volume II.I think Andrew Menkhart can get you the book from this website. I am considering to buy a late 1920's or early 30's Seagrave fire engine with a 12 cylinder Buda engine in it. Can anyone tell me its history, what it would be worth or where to get parts for it?? All help and comments are appreciated!! I'm restoring a 1923 Atlas truck with a WTU Buda engine. I was concerned about the correct color of the Buda engine. Could anybody help me? What color did Buda paint their engines? I am seeking some clues about the Buda 4 cyl engine that was in the 1924 to'27 Luxor taxicab. In some old misc parts manuals I have, I see a 153 and maybe a 210, (no yr, listing) which I bet are cubic inches?? One parts listing makes mention that the early engine had only a 3 main brg crank. Well the 153 is a very common engine used in a number of tractors in the 40's and 50's.They are in the 30HP range,and are way too small and new to be in a 1927 taxi.The old buda engines used 2 or three letters as the model number.I only have a listing for 1935 tractors so can't really help without more info from you. Hi, there is a gentleman by the name of Chuck Rhoades in Collinsville, Il that is very knowledgeable about Buda Engines. PS I could use a Buda Model HU engine for an old truck i am restoring. of the late 1930's six cylinder models. Could have bought a complete and reportedly runnable Buda-Lavona(?) six cylinder diesel recently. Looked like a 40s or earlier engine. I'm looking for a 6DT-317 Buda Lanova. Is that the engine that's for sale? If it is please email me at journeysend.farm@t6b.com if it's not something you're interested in. Need more info to help much. A picture or engine size or casting numbers. The most common seen buda casting mark is an S with a f in the top loop and a co in the bottem. I have inherited a 6DT-468, non supercharged buda diesel engine, assembled, new and in cosmolene and packing material. I also have the parts for a complete 2nd engine and additional parts most new. I do not have a use for these vintage engines. Does anyone still use these? Is there a market for the engine and parts? 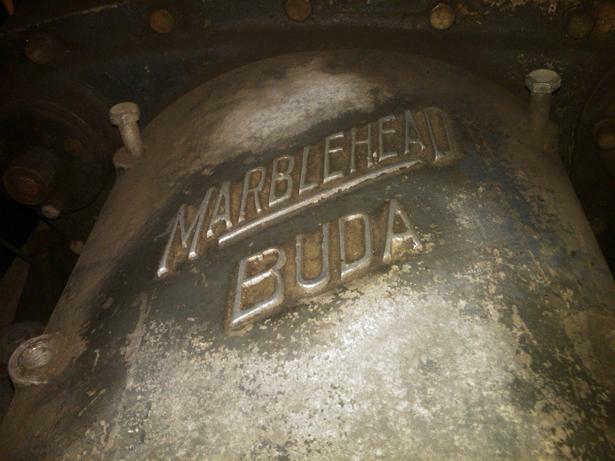 I am restoring two tractors and need the upright exhaust and intake maniforlds for the following Buda engines. One tractor has a Buda YRA engine 4 1/2 X 6 stroke and Bore( YTU, YBU-I, YBH are interchangeable based upon the parts book. The second engine is a YRC with a 4 3/4 X 6 inch stroke and bore. YRH AND YR425 are shown as interchangeable. Thanks for any help. I need a Buda WU motor: four cylinder L-head, no removable head. Anybody out there? Thanks. Assuming you haven't found a WU, have you looked into whether a WTU would suffice?? No, I don't know what the difference is--Buda had many of these (YU/YTU, XU/XTU) apparently always of the same b/s. I've emailed Buda in Shreveport and John Paulsen in Olympia (no replies) and asked on smokstak, but got no definitive answer. In one catalog I eyeballed, Huffman showed both in one 1920-24 model and Traylor showed both in a 1920-28 model (1933 catalog). Most makes that showed both engines, tho, showed the WTU in later years. My apologies if we've emailed before; my ISP changed systems and I lost some old email files. Assuming you meant rods and rod bearings there's a note in one catalog that they're furnished "...undrilled or drilled two or four holes per half bearing...".